I was at a Kansas City Royals game a week ago Friday night when the Royals took on the Baltimore Orioles, it was my 99th game of the season and the Royals won, 1-0. I remember the game well since I “geeked” the game by keeping book. I remember the Royals pitcher had a perfect game going until the 6th inning, 6.2 innings to be exact. As I was walking around Kaufmann Stadium, I took a break to stand in the Dugout Concourse to root on the Royals pitcher, which had to be about the 3rd or 4th inning. 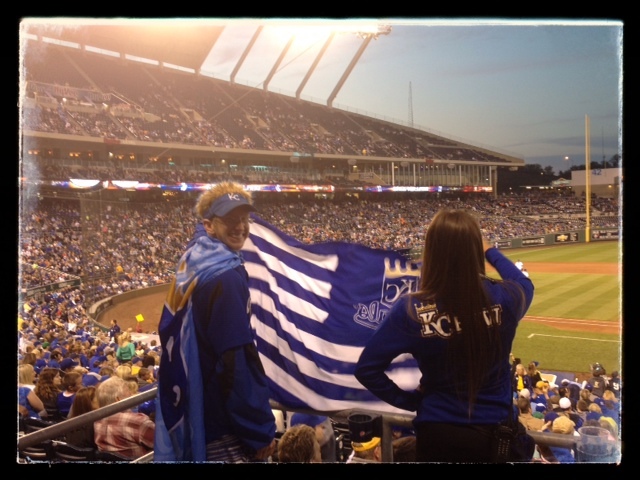 As I was standing there I noticed this dude in a cape made of a Royals flag. A fan next to me, who didn’t seem to know much about baseball and probably got his tickets from work, thought he would impress his girlfriend with how important he was, remarked snidely, “It takes all kinds…” then he rolled his eyes in a gesture I could only determine to be dismissive of this guy in the cape. I wanted to point out to this “jackass” that I was “geeking” the game myself. Of course, I wanted to meet this dude in the cape. I have found guys like this are some of the nicest, most genuine people. Chris told me he has talked to the media before and I noticed he was at ease with all the questions I was asking. People were constantly coming up to get pictures with him. He obliged with a smile each and every time. I asked where his seat was. He told me a few years ago there was an issue with his original ticket so he just purchases the cheapest seat he can get which saves him a lot of money. He explained further he prefers to stand in the concourse area, which is behind the Royals dugout about 20 rows up on the first base side, since it’s closer to the action. As ushers and other Royals staff walked by they all said hi to Chris or grabbed his arm. He made sure to acknowledge each and everyone, almost all by name. With all this attention, I asked how often he comes out to games. He told me that he attends all the games. I said, “All? As in 81?” He said “Yes, all 81.”. I was like “holy cow” but I didn’t say “cow”. I understand the love of baseball and I have been referred to as a “Super Fan” like Chris is but I have never attended more than 15 games in a Brewers season. I like variety. As I continued to grill Chris he said it had been going on for about 10 years, again, I was like, “t-e-n, 10?” He said, “Yeah.” Then thought for a moment and said, “Yeah, this is May and the streak started in May, 10 years ago.” I was again speechless, “you mean to tell me that you haven’t missed a Royals home game in 10 years, not even one?” he said, “No”, very unassuming, like most teams “Super Fans” have done it. So, of course, I was like how in the hell can you come to all the games? What kind of job allows for this? He says, “I take vacation days when the Royals have a day game.” He has worked for the Post Office as a Postal Carrier for the last nine years, a job he got straight out of high school telling me he was very lucky to get it on his first try. When the streak started Chris was still in high school and admitted his parents would let him skip school to attend games during the day at the beginning of the baseball seasons. 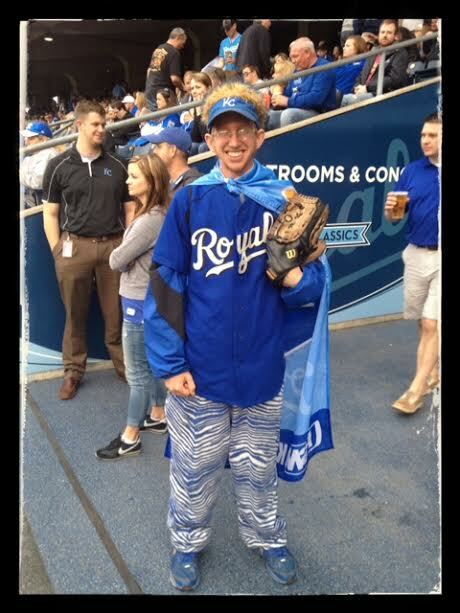 Chris said he wasn’t much of a ball player growing up but he loved watching and following the Royals. As we talked he would interject information about players of years gone by. I felt like I was on the bottom rung of the baseball super fan ladder compared to Chris. He has been to all but two of the MLB stadiums and keeps in touch with other “Super Fans” in different parts of the country. I loved everything about Chris. He was very genuine and nice. He had his goofy baseball “get up” on but as a person he didn’t strike me as goofy at all. He seemed very happy and content. I watched Chris rally the fans a few times as I continued to walk around the stadium. I would look over to see Chris standing talking to others and taking pictures. For someone so young he has brought a lot of happiness to a lot of people by just attending baseball games. I guess that is my point, if it brings you happiness and doesn’t hurt others, I say do it! You might just find others find you inspiring at your simple happy gestures. I wish I could write another 1000 words on Chris but I need to wrap this up. I hope it was worth the wait, I sure couldn’t get Chris out of my mind. Thanks for spending the time with me Chris, you are a very humble and gracious person! So yesterday was Day 99 and I wrote a blog about something that happened eight days ago, just want to make everyone aware how this works! Thanks for sending me suggestions and connections regarding how I can continue working in baseball after this journey ends. I am finding out how everything and everybody is connected. I am so grateful that I have gotten out of my “comfort zone” and am doing this. If you enjoy this story and you would like to help me complete the “Baseball in America Tour 2014”, which is roughly 265 days, please click on the following link to see how you can help at www.baseballbuddha.com. Follow me on Twitter and like my Facebook page! Please share this on your Facebook page and Twitter. I appreciate all the help I can get! I have the pleasure of being a former neighbor of Chris’ Girlfriend. Both are the sweetest most genuine folks. Love them Both and their Baby Boy! An outstanding share!I’ve just forwarded this onto a coworker who had been doing a little homework on this. I met chris a few years ago when we played on the same kickball team. He is one of the nicest and most genuine guys I know. The royals organization doesn’t give him the recognition he deserves. Any game I go to I make it a point to swing by and say hello.